But for the past 12 months, the durable stroller has been relegated to gathering dust in the garage, prompting me to finally, reluctantly, advertise it for sale. It is of no use to us any longer. And yet — emotionally — I’m not quite ready to let go, a realization I am just now fully absorbing as I stand in my driveway with this complete stranger. I glance at the woman’s newborn napping peacefully in the car seat, her tiny mouth locked in a rhythmic sucking motion, unaware that her pacifier dislodged somewhere along the way and now rests between the duck-covered feet of her bright yellow sleeper. “Your baby is beautiful,” I say, trying to quell the unexpected pang of jealousy I feel rising up inside of me. She is a brand new mom, the tell-tale signs impossible to miss: those weary, sleep-deprived eyes; the dots of escaped breast milk just beginning to dampen her shirt; the rookie struggle to master my stroller’s three-point harness and collapsing mechanism. Motherhood stretches before her like an infinite highway, an endless horizon. And I am unmistakably envious. Still, I consciously resist the urge to articulate what I long to convey to this woman, refusing to allow such trite words to flow from my tongue. Instead, I silently will my pithy plea toward her, even as I bristle a bit at the utter cliché: Cherish every moment. In the same instance, I recognize — I remember — just how difficult it can be to embrace that mantra while rooted in the trenches of parenting young children. When each day is defined by valiant attempts to balance newborn needs with toddler tantrums, one 24-hour span dragging into the next. When the joy we are supposed to feel gets blurred by mounds and mounds of laundry, and all we want to do is rest our weary heads upon the piles of onesies and inhale their sweet Dreft scent. All the moments we wonder if we will ever figure out how to possibly do all of this, much less do it right. But then our surprise blessing arrived, forever altering the tapestry of our lives — and changing everything I thought I knew about motherhood. It’s not that I love one child more than the others, or that I wasn’t passionate about raising my first two; I was. But somehow the third has made me treasure the experience in a completely new and profound manner. I sometimes wonder if this transformation stems from having added a late-in-life baby to the family; is it a byproduct of maturity, an appreciation magnified only by the lens of 20/20 hindsight? Maybe it’s more like a mommy do-over, a chance to do it better? Or perhaps it’s simply the consequence of being unable to disguise the fact that I’m getting older, a somber awareness of my imminent mortality. Regardless, the awareness prompted me — when my daughter was just an infant — to promise to savor every last stage with her. I vowed not to give in to the all-too-natural parental yearnings to be transported to some future moment, as I had done at times with my boys —wishing my child was more independent, more self-reliant, better able to communicate. I still remember the moment precisely; I was power walking with my BOB through the neighborhood park, observing scores of other mothers as I paced. Some were dutifully pushing babies on swings, others chasing toddlers through the sand, a few watching from a safe distance as older kids maneuvered across jungle gyms. And as I envisioned Aubrey at these various ages, I consciously pledged to be present in every moment with her. There would be plenty of time for all the activities I was looking forward to — for dance recitals and horseback riding lessons, sandcastles and sleepovers. Cherish every moment, I told myself. Embrace every last stage. But what I never anticipated, what I had failed to experience with my first two children, would be the ache to go back. That after we played pat-a-cake and read Goodnight Moon, after we discarded the pacifiers and Sippy cups, after the strollers and car seats had been outgrown, I would be left with such an overwhelming desire to stop the clock— anything to keep my baby, my last child, from growing up right before my eyes. Five years ago. The first Christmas of my last baby. 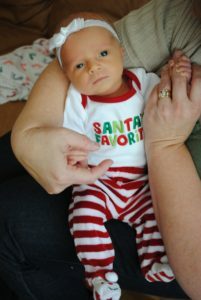 There she is, so pink and new and perfect, all decked out in those adorable red and white striped jammies with the Santa Claus feet. I can still smell that newborn aroma, sweet and unmistakable. I can still feel the soft wisps of blonde peach fuzz that grazed her perfect little head. Four years ago. She has her back to me, her face pressed up against the fence at the baseball field. 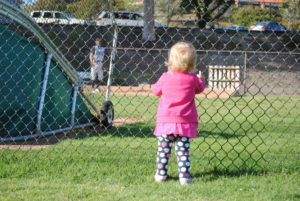 Her tiny fingers are looped through the chain link while she watches in awe as her big brother warms up in the bullpen. Two years ago. 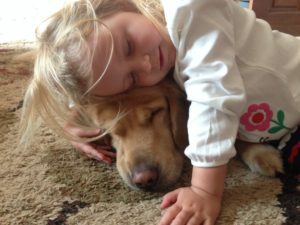 That endearing snapshot of her crashed out on the floor, using the Golden Retriever as her naptime pillow, two pals bonded in slumber. Damn you, Facebook. If you really cared about me, then you would know not to have retrieved those precious memories, those ruthless reminders of just how quickly time is marching on. It terrifies me that I will blink, and my daughter will be 10. And then 15. Indeed, this little person who enthusiastically tells me she loves me dozens of times a day, so freely offering bear hugs and tender kisses, will one day morph into a teenager. And while I imagine there will be highlights of that phase, as well — swapping clothes, shopping for prom dresses, the requisite college tours — I can’t help but grieve the precious moments slipping away far too fast. There are mornings I am pressed with work projects when I momentarily envy the parents who cruise through the school drop off line with kids that bound out of their cars, eager to race to the playground. My own, by contrast, still clings to my hand and insists that I wait in line with her until the very last moment when she and her classmates file through the door to their transitional kindergarten classroom. Yet I quickly shrug off any desire to drop and go, instead relishing the little hand clasped inside of mine. Because I can already feel what I know will be a crushing against my heart when the day comes and she insists on going through the school gate alone. Without me. I wonder if this new mom will one day experience this same nagging sense of loss, the one that envelopes me now as I watch her scoop up my trusty BOB, place it into the back of her SUV and drive away. Just like my little girl, those three faithful wheels are moving on to new adventures, and I have no choice but to say goodbye — goodbye to the stroller I swore I could never go back to, but ironically, now wish I didn’t have to let go.